The Exchange is a two year pilot project bringing together artists, creative SMEs and early career researchers to enrich the ecology between the creative industries and academia. The Exchange launched in January 2016 and is managed by The Culture Capital Exchange (TCCE) and supported by Arts Council England and the Higher Education Funding Council for England. The Exchange will work towards establishing a national network through which artists, creatives and researchers can develop mutually beneficial relationships and break down barriers to collaboration. 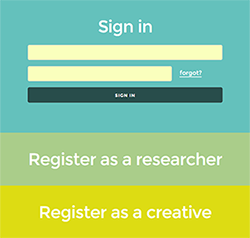 Seed funding of £5K each will be available for up to 30 collaborative research projects. The Exchange builds on more than ten years’ experience that TCCE have gained collaborating with HEIs and the creative and cultural industries. TCCE is a unique company promoting the exchange of universities’ knowledge and expertise with the cultural and creative sectors. We have been in existence since 2004 and were previously known as LCACE (London Centre for Arts and Cultural Exchange). We support our member universities to achieve collaborative work in areas such as Knowledge Exchange, Public Engagement and Impact and work with a huge range of partners in the Creative and Cultural sectors in London. Regular information events on research calls, impact, international funding etc. If you would like to find out more about TCCE and how you can get involved with future TCCE activities and collaborations, please do get in touch. We’d be delighted to hear from you.